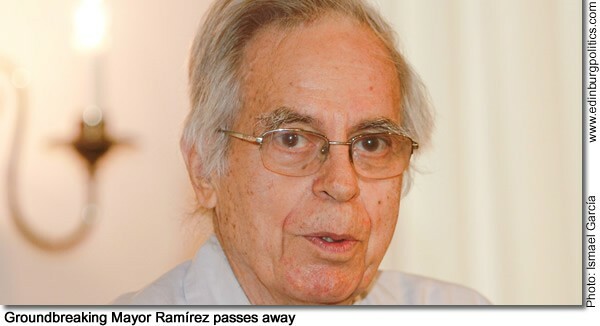 Al Ramírez, Edinburg’s first Mexican American mayor who served from 1963 to 1967, passed away on Wednesday, April 22. 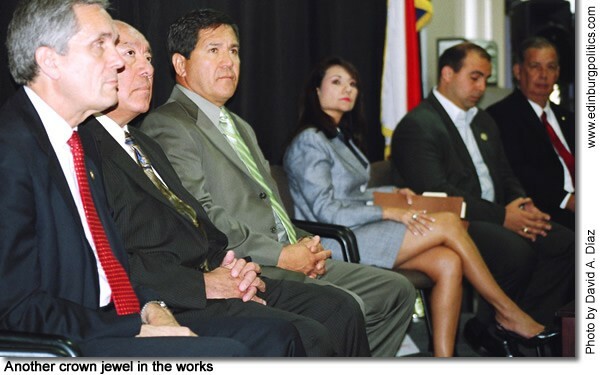 The groundbreaking mayor, shown here last August 21 during a campaign kick-off for Edinburg school board trustee Carmen González, was credited for helping desegregate public swimming pools, among many other achievements. 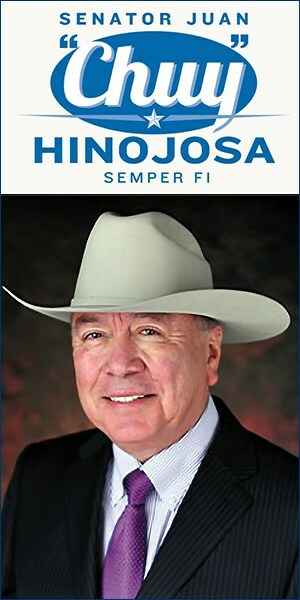 "We lost one of the great men of the Valley," said former Rep. Alejandro Moreno, D-Edinburg. "He was a descendant of pioneer families. He was a former mayor of Edinburg who welcomed the striking Rio Grande City Farm workers from a hospital bed on their 1966 march to Austin. 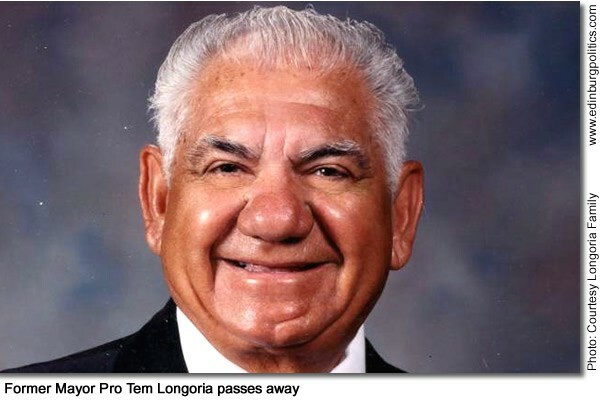 He was a life long educator who helped develop bilingual curricula in the 1970’s. He also published history and genealogy books and had a great sense of humor. May he Rest in Peace." See obituary later in this posting. 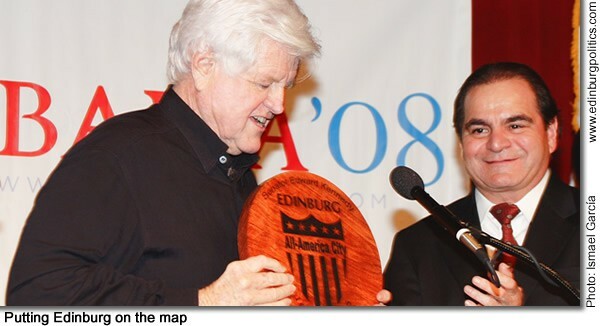 Sen. Edward Kennedy, D-Massachusetts, a guest of Mayor Joe Ochoa during Kennedy’s visit to the University of Texas-Pan American in February 2008, accepted a replica of the community’s All-America City Award, a symbol of some of many achievements generated during the leadership of Ochoa, who is not seeking reelection. 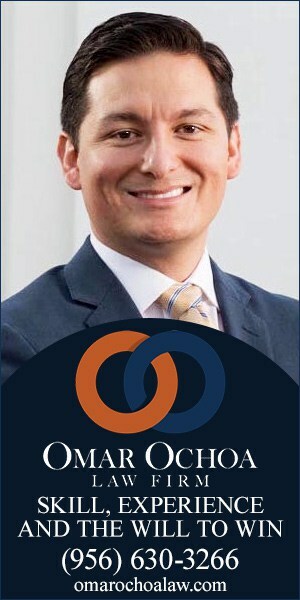 Ochoa, who a few days after Kennedy’s visit welcomed then-presidential candidate Sen. Barack Obama, D-Illinois, to the three-time All-America City, will be making one of his final official appearances as mayor on Thursday, May 7, as part of the National Day of Prayer. The prayer breakfast, which will take place from 6:30 a.m. to 8 a.m., will be held at The Social Steak House and Club, 205 Conquest Boulevard in Edinburg. There is a $15 fee, which includes breakfast along with a special gift to the first 150 people, courtesy of the Edinburg Chamber of Commerce. 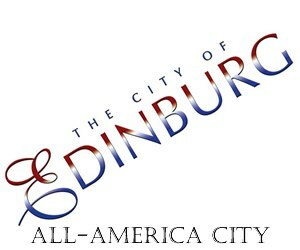 For more information or to RSVP call the Edinburg Chamber of Commerce at 956/383-4974. United States Army Major General (Retired) William F. Garrison, featured second from left, a 1966 alumnus of the University of Texas-Pan American, came back to his alma mater recently to address military cadets in Edinburg. Garrison became most famous for his role as the commanding officer of Operation Gothic Serpent, the military operation launched in 1993 to capture Somalian warlord Mohamed Farrah Aidid, which ended with the Battle of Mogadishu on October 3, 1993. Actor Sam Shepherd later portrayed Garrison in the film Black Hawk Down, which chronicles the events of the Battle of Mogadishu, regarded at the time as as the biggest single firefight involving American soldiers since the Vietnam War. 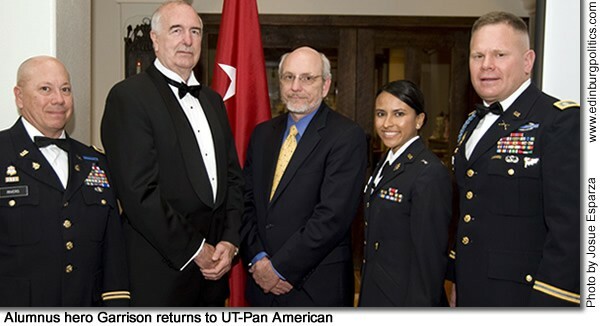 Featured, from left, at at the Dining-In ceremony for UTPA and UT-Brownsville/Texas Southmost College ROTC cadets are: Colonel (USAR) Christopher B. Rivers, UTPA assistant director of military science; United States Army Major General (Retired) William F. Garrison; UTPA Provost and Vice President for Academic Affairs Dr. Paul Sale; Cadet Bronc Battalion Commander Vanessa Randolph; and Lieutenant Colonel André Dean, professor of military science and commanding officer of the UTPA battalion. See story later in this posting. 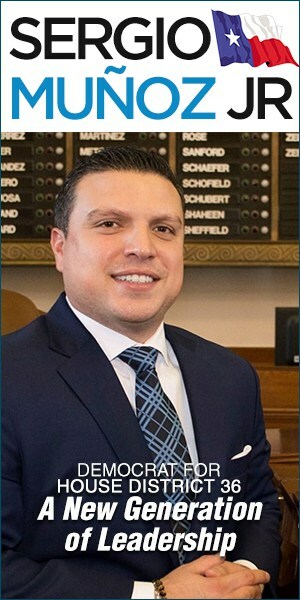 Saturday, April 25, was declared Texas Meningitis Awareness Day under a measure by Sen. Eddie Lucio, Jr., D-Brownsville, which was approved by the Senate on Friday, April 24. Bacterial meningitis is an inflammation of the membranes that surround the brain and spinal cords. The disease strikes 2,000 to 3,000 Americans each year, and 10 to 12 percent of those infected die. There is also a viral type of meningitis. Lucio also named a bill by Sen. Wendy Davis, R-Fort Worth, requiring bacterial meningitis vaccinations for first-time college students living on campus in this state, the Jamie Schanbaum Act, after the 20-year-old University of Texas student has been hospitalized for the past six months with the less common and more violent version of the bacteria Meningococcemia. 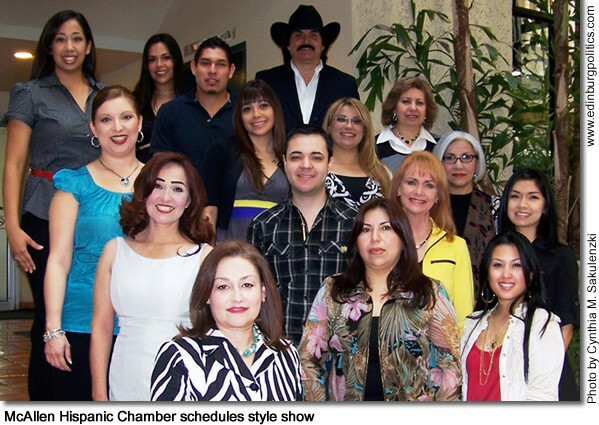 Jamie Schanbaum’s mother, Patsy Silva Schanbaum, is originally from Brownsville. Featured on the Senate floor on April 24, from left: Lt. Gov. 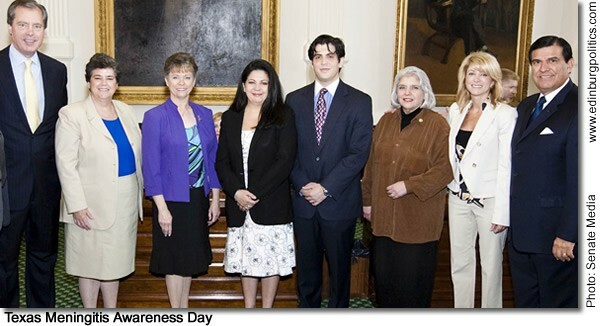 David Dewhurst; Maureen Moore, of the Houston Area Immunization Partnership and Confederation of Meningitis Organization; Nancy Day, representing her son, Kyle Hendrix (Meningitis survivor); Patsy Silva Schanbaum, representing her daughter, Jamie Schanbaum (Meningitis survivor); Jamie’s brother, Nicholas Schanbaum; Sen. Judith Zaffirini, D-Laredo; Sen. Wendy Davis, R-Ft. Worth, and Sen. Lucio. See story later in this posting. 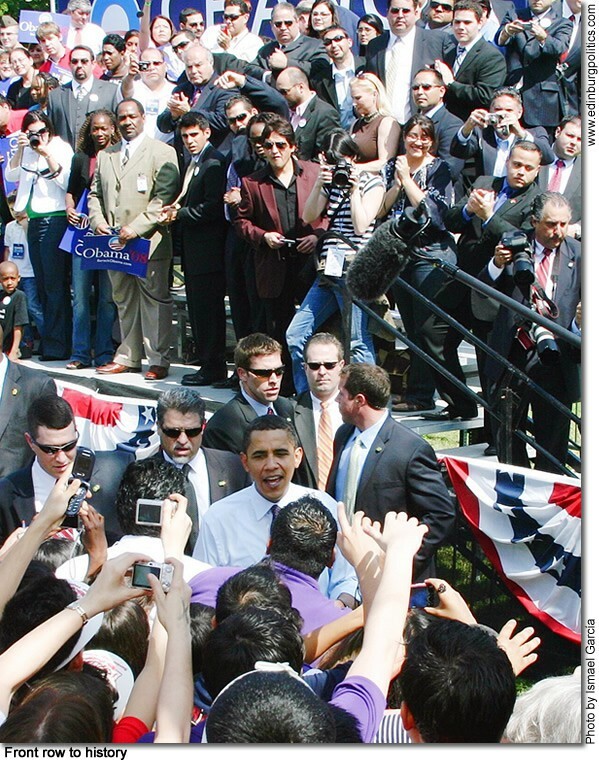 When then-Sen. Barack Obama came to the University of Texas-Pan American in late February, you could literally count on one hand the number of elected officials who endorsed the man who would be President – and three of them were from Edinburg. 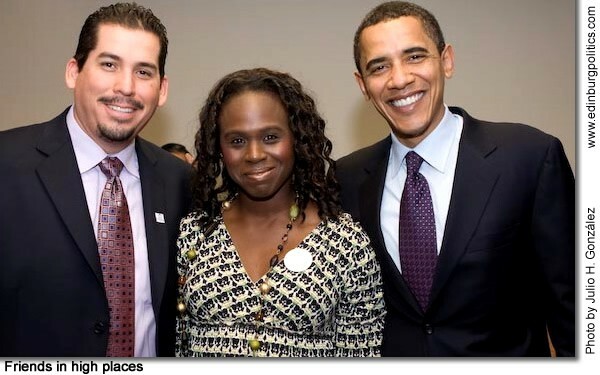 Edinburg Councilmember Gus García, Jr., featured here with his wife, Tonya, publicly supported Obama during his February 22 visit to the University of Texas-Pan American. 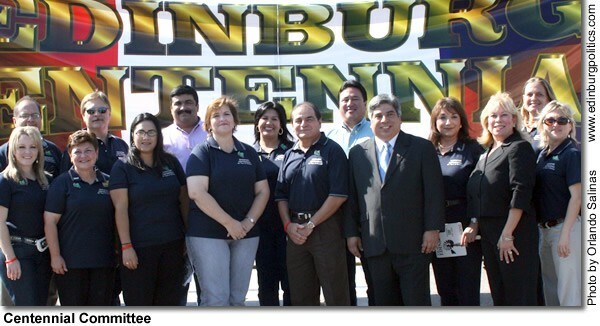 Also endorsing Obama were Edinburg Mayor Joe Ochoa, Rep. Eddie Lucio, III, D-San Benito, and Edinburg school board trustee Robert Peña, Jr. 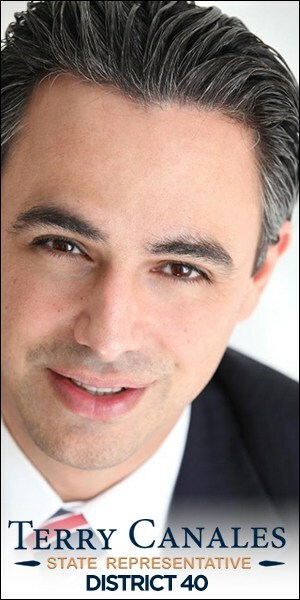 The South Texas leaders astonished the Rio Grande Valley Democratic power brokers when they backed Obama against a hugely popular Sen. Hillary Clinton, D-New York, for the Democratic Party presidential nomination. Almost a year later, their public support of Obama could help Edinburg and South Texas keep their presence and issues known to the newly-elected President, says the local councilmember. See lead story later in this posting. 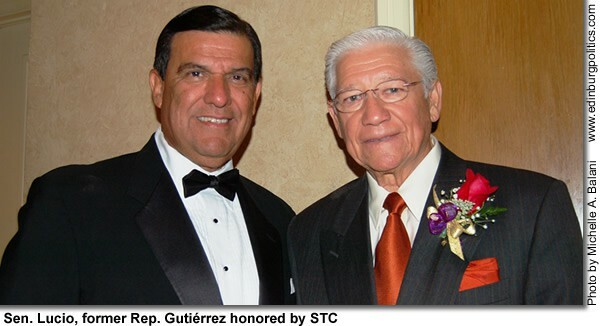 Key legislators, featured in this file photo during the opening of South Texas College Technology Campus in McAllen in 2006, could soon be joining forces again to bring another higher education crown jewel to the Rio Grande Valley. 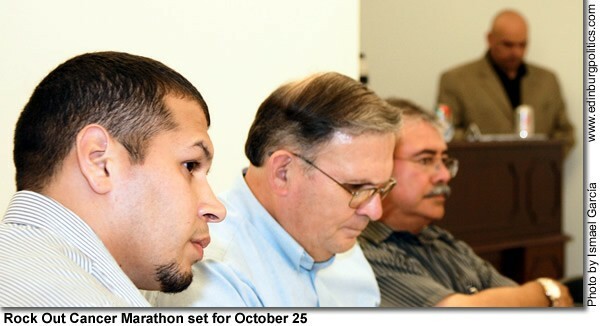 Rep. Ismael "Kino" Flores, D-Palmview (third from left), says he is coordinating a public meeting with the City of McAllen, the University of Texas-Pan American, and South Texas College so McAllen officials, led by Mayor Richard Cortéz, may lay out their vision to bring graduate-level university courses to the City of Palms. 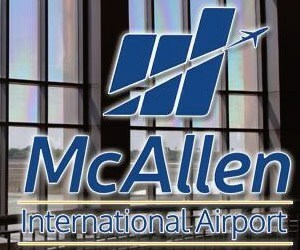 "For some time now, the leadership of McAllen has been working on ways to continue bringing additional higher education opportunities for the people of South Texas," Flores said. 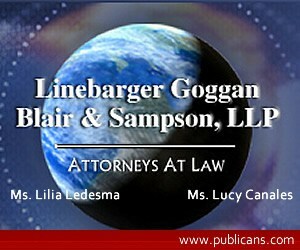 "Under a state law I authored four years ago, the way has been paved for helping do just that." Joining the Palmview Democrat in this shot were, from left: Congressman Lloyd Doggett, D-Austin; Sen. Juan "Chuy" Hinojosa, D-McAllen; Flores; Rep. Verónica Gonzáles, D-McAllen; Rep. Armando "Mando" Martínez, D-Weslaco; and Cortéz. Sen. Judith Zaffirini, D-Laredo, carried the Flores legislation in the Senate. 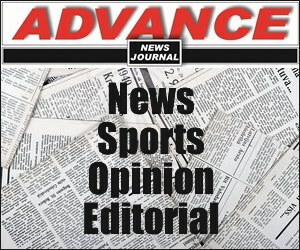 See story later in this posting. 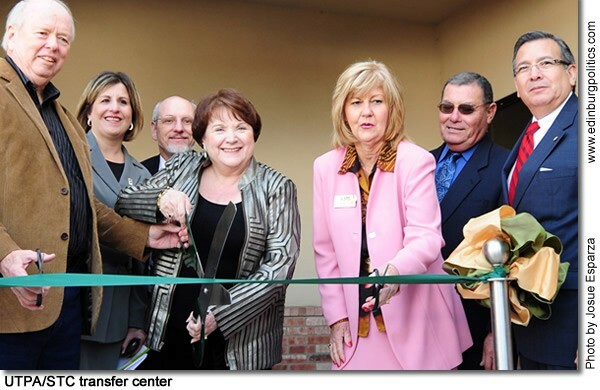 The University of Texas-Pan American has now made it easier for students to transfer from a two-year college to the University through the help of the newly opened UTPA Transfer Center. A grand opening was held Tuesday, January 13 at the center, which is located at Pecan Boulevard and 29th Street in McAllen. 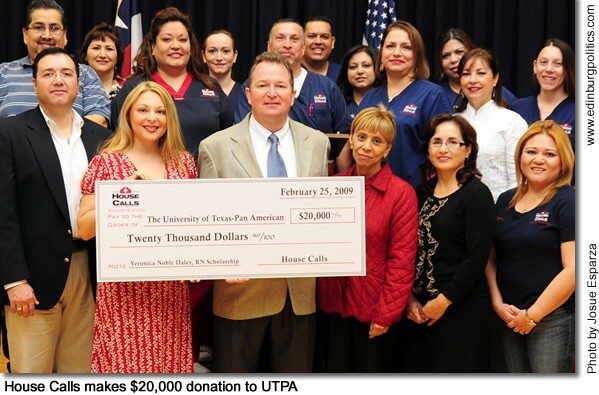 “It is this sort of partnership and teamwork that will pay off ‘en grande’ for the students of STC and most importantly for the economy and prosperity of the Rio Grande Valley,” UTPA President Dr. Blandina "Bambi" Cárdenas said. 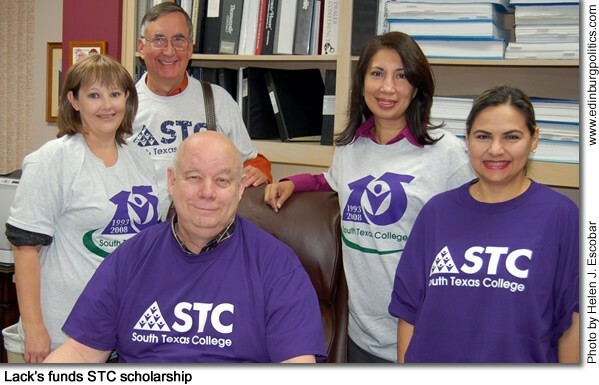 “It has become far more urgent that we make sure students have the information they need in order to make efficient decisions in their college pathway.” Featured at the ceremony, from left: Mike Allen, board of trustees, South Texas College; Dr. Magdalena Hinojosa, UTPA associate vice president and dean of admissions and enrollment services; Dr. Paul Sale, UTPA provost and vice president; Cárdenas; Dr. Shirley Reed, STC president; Alejo Salinas, board of trustees, South Texas College; and Mike Pérez, McAllen city manager. 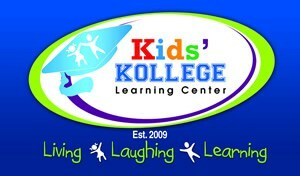 See story later in this posting. 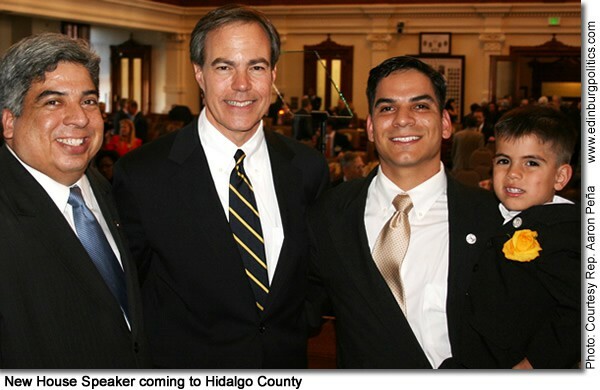 Texas Speaker of the House Joe Straus, R-San Antonio, featured right, will be in Weslaco on Thursday, January 22, as part of a major legislative tour coordinated by the Rio Grande Valley Partnership, according to Rep. Aaron Peña, D-Edinburg, featured left. 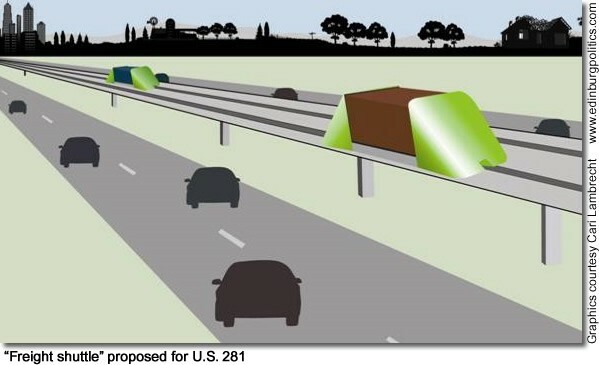 Straus will be joined by dozens of other state lawmakers for the only scheduled visit into Hidalgo County, according to the tentative schedule that has been distributed to state senators and representatives by the Rio Grande Valley Partnership. 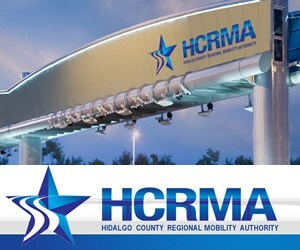 The speaker and the legislators will meet for a reception with mayors of Hidalgo County at 7 p.m. at the home of Patti and Larry Dittburner at 2912 S. International Boulevard, according to Peña. 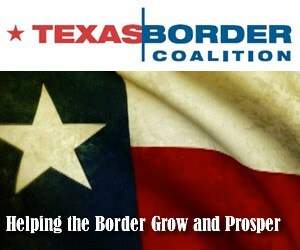 Later in the week, the legislative delegation will primarily visit key points in Cameron County. 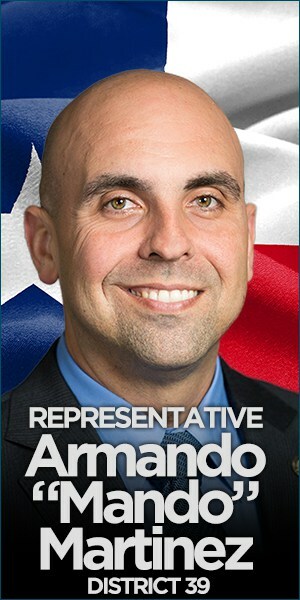 The Rio Grande Valley Partnership is hosting the tour for dozens of legislators from across the state from Thursday, January 22 through Sunday, January 25. 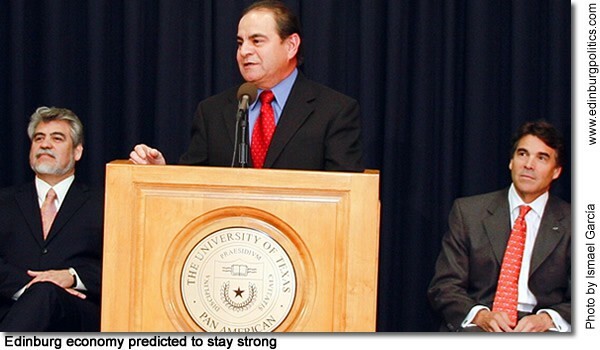 "Joe Straus is a good friend and I congratulate him on his unanimous election as our new speaker," said Peña. 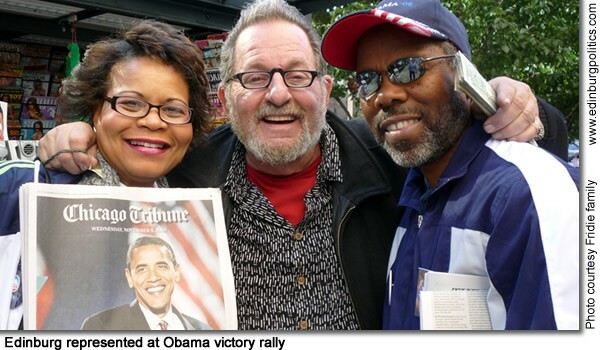 "We have been able to succeed in the past because of our willingness to work with members on both sides of the aisle. In these dire economic circumstances and with our state facing a grim budget outlook it becomes so much more important to put aside partisanship and do what is best for the state of Texas. 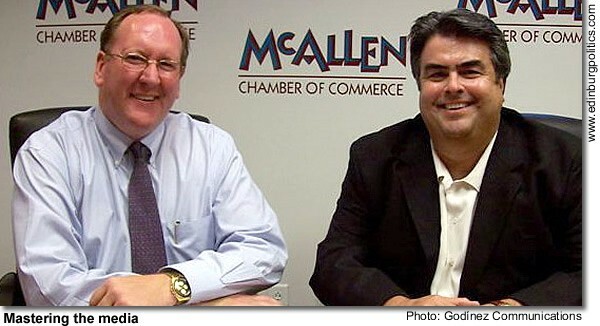 That is why I invited Speaker Straus to join our colleagues in a tour of the Rio Grande Valley." 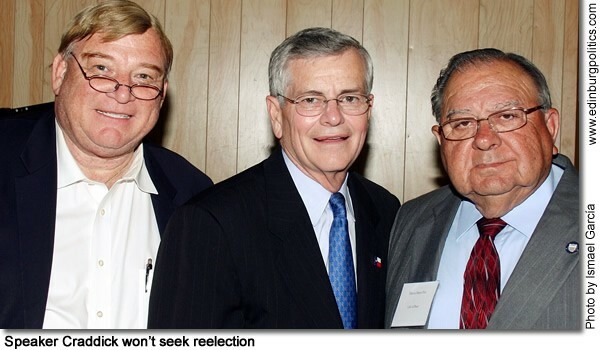 Featured, from left: Peña; Straus; Aaron Peña III; and Aaron Austin Peña. See story later in this posting. Sen. Judith Zaffirini, D-Laredo, featured third from right, on Tuesday, January 13, was sworn in for another four-year term representing Senate District 21, which includes Starr County. Lt. Gov. David Dewhurst presided during Opening Day Ceremonies, officially gaveling to order the 81st Texas Legislative Session. "I truly am delighted to renew my unwavering support for all families in our district," Zaffirini said. "I especially look forward to prioritizing education and health and human services and to ensuring the health and welfare of Texans, especially those whom I represent." She returns as the highest-ranking senator for Bexar County and the border region. 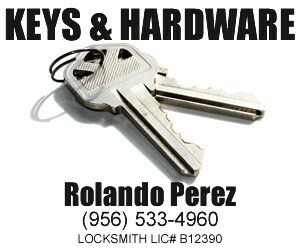 including Starr County. 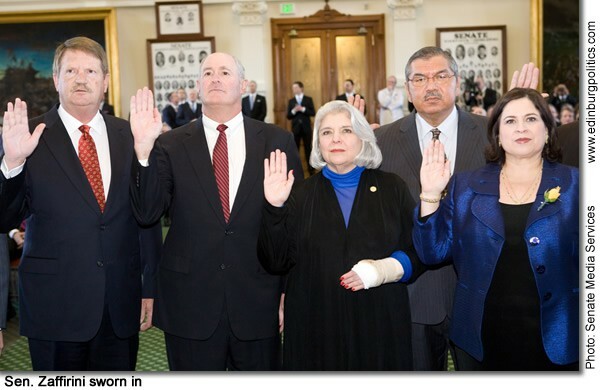 Featured, from left: Sen. Mike Jackson, R-La Porte; Sen. Kel Seliger, R-Amarillo; Zaffirini, D-Laredo; Sen. Mario Gallegos, D-Houston; and Sen. Leticia Van De Putte, D-San Antonio. See story later in this posting.